Five member boyband, Code V ( formerly known as Bless) released their new album Honestly May 22,2011 which features 8 songs 2 instrumentals and 1 remix. I got into Code V when they released their Addiction single last year and I had been anxiously awaiting their comeback, so this release makes me happy.The group went on a hiatus after the release of their single ‘Addiction’ and member change after Taemin decided to leave the group. 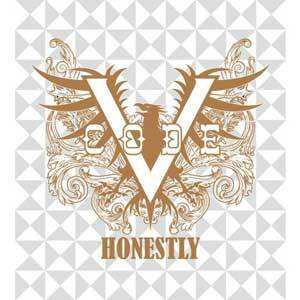 The group returned this week with their new album Honestly and promotional track, Tell You Honestly. Tell You Honestly goes for a more soulful ballad featuring an organ instead of the smooth sound of a piano. Go! is a more upbeat song; sounds like something that a new group might debut with. Their voices sound off pitch on some parts in the song and like one members voice is higher than the others. This song doesn’t really show off the guys voices in a nice way and the song is lackluster. Summer Love reminds me of a TVXQ song; this is very happy and the overall sound of the song fits the title – very summer time and carefree. This song may be happy and fun, but this song also feels like something is mising. The middle 8 is absolutely gorgeous! I normally don’t like when guys try to reach the high notes, but this works with them. Miracle is a mid-tempo ballad. I love these kids of songs and I feel like most artists feel the need to release a lot of bubblegum sugary pop songs and forget about actually showing off their voices in nice,uplifting songs like this one.중독 is the song that really got me into the group like many others. I really liked this song and how it was styled; soft mixed with rough and mid-tempo; there are really no other words for me to write about this song. I’m More Sad is another song from their EP that I fell in love with; I love R&B and they have the smoothest voices. A lot of times groups don’t know how to blend their voices especially when singing R&B, but this just flows so well. I’m Coming To Meet You Now was featured on the Baker King, Kim Tak Goo Soundtrack so this song hold a special place in my heart. I watched the drama and this is like a nice little present from the group.Do Not Be Reconciled is another ballad that sounds so magical; this song reminds me of something that might be played during a dramatic scene. The build up to the climax is quite nice.중독 (Remix) whoever made this remix totally botched it. The song was so nice the original way, but this has way too many elements going on that instead of it making me want to listen to the original, it makes me want to stop listening to the song altogether. This album was better than what I expected; actually I didn’t really have a lot of expectations. Even though a lot of the songs where from the EP, the flow of the album went really well; I can’t wait to hear them perform this live. I rate this 4/5! omg, i love this album! they’re voices are love. and i do not know what the middle 8th is, but miracle is my favorite track after summer love… well i like addiction and i’m more sad too, and then again, i just love them all. lol and i want them to perform more!